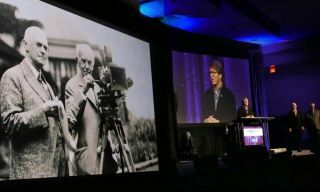 The Cinema Summit, organized by SMPTE and NAB and held each year in Las Vegas the weekend right before the opening of the show floor at NAB, is perhaps the best place to examine the nation’s most iconic pillar of the entertainment industry. The best thing about the Summit? On the surface, it looks like a laid-back affair. Studio execs mingle with engineers and production people and hardware and software providers– outside the realm of the big PR machines and away from the hype of either Hollywood or the mass media. And the Cinema Summit is kind of sandwiched in between the folds of more high profile events– the Oscars, the NAB show itself (that’s more about the Television industry), CinemaCon (where the movie theater owners meet, that always bumps up against the Cinema Summit), and a variety of smaller conferences in L.A. and New York. So in this quiet back lot of sorts, on the eve of NAB, the big players are here, but relaxed and in a mood to talk about what the big studios have always been about: technology. New technology. Disrupted technology. Technology that will circle the wagons against TV, or VOD, or whatever else they will throw our way, and save big screen Cinema (again). But don't be deceived by the laid-back appearance of the Summit. Things get done here. Alliances are made and broken, as the industry’s top strategists gather. After a two-three year plot diversion that featured a variety of Hollywood villains and heroes flogging what was not much more than a minor character actor– HFR (High Frame Rate: shooting and projecting at more than the historical 24fps rate for film or video)– Hollywood’s posse of top executives, production designers, engineers and technical exhibition hired guns are mounted up here in the desert and back on the trail of what is ostensibly Cinema’s biggest villain today: dim, stale screens in theaters and what everyone knows is the most problematic manifestation of that: even dimmer 3D imagery in commercial movie theaters that translates to a mediocre movie experience that translates to mediocre ticket sales. Yes, the Cinema Summit this weekend featured seminars and panels on other important issues that have popped up in the wake of the analog to digital transition (lack of archiving standards for digital; audio not just video issues; HDR) but there is near-unanimous agreement in Hollywood that the most important issue is: if we don’t get the wow factor unequivocally, measurably back on the big screen the other issues will be moot. Cinema Summit attendees were given a preview Sunday of the new SMPTE documentary "Moving Images", that explores the development of motion imaging technology from turn of the twentieth century through the present– and like the Summit itself with a look to technical breakthroughs on the horizon. From left to right: on the big screen in the movie clip: George Eastman, and Thomas Edison; "Moving Images" producer Howard Lukk at the podium; the movie’s cinematographer Randall Dark; and Moving Images session moderator Pete Ludé of RealD. At last year’s Cinema Summit, these trends were already being recognized, and the race among the big technology providers to find a solution was heating up– with the showing of Laser light source projectors at Cinema Summit 2014. But with all the talk– and demos from Barco, Christie, and NEC last year– of the potential of the new laser technology, the key word last year was “potential”. The projector manufacturers were jockeying for future position with different laser platforms. Christie behind a 2-projector, laser illumination offering for 3D; Barco with a one-projector 3D solution; and NEC with a Laser Phosphor Projector aimed at smaller screens needing less lumens than what Barco and Christie were gunning for. There was a great deal of argument over which laser system was best for 3D, and dueling engineers talked about heating/cooling and a variety of engineering issues– all with one goal in mind: get more lumens on the screen. The laser projector demos were impressive last year, but there was a general feeling that NATO members (i.e. theater owners, members of the National Association of Theater Owners) were still bruised and beat up a little from having invested a lot in conventional 3D and some of them HFR on top of that, and that it would be a hard sell to try to push another “upgrade” in projection technology on them. What a difference a year makes. At the Cinema Summit this weekend, the landscape has changed. Laser projection is no longer an intriguing option out on the horizon. The race is on, now, and the big players are making alliances, making sales, and firing salvos not with PowerPoint presentations but with real product. At this year’s Cinema Summit, Christie did not participate in demos, ostensibly because they were keeping their powder dry for an important CinemaCon, that starts April 20th in Las Vegas. (Sony, that has also demo’d projectors at past Cinema Summits, also did not have a presence in the agenda at this year’s event.) But Christie’s absence in the official agenda at Cinema Summit 2015 does not mean that Christie is not big on scene with Laser projectors. Last December, Christie and Dolby Laboratories announced that Christie would co-develop, supply, install, and service Dolby Vision projection systems for “Dolby Cinema”, a branded premium cinema offering for exhibitors and moviegoers that delivers "the total cinema experience" according to Dolby. The JT Eindhoven cineplex in the Netherlands opened in December 2014, the first Dolby Cinema locations to install a “Dolby Vision” projection system supplied by Christie. In the system the projector is comprised of two projector heads– keeping with the two-projector, sequential left-right eye 3D system that Christie has been showing since NAB 2014. In addition to the visual element, Dolby is also using this new platform to help solidify its Atmos audio that it introduced in April 2012. Indeed, now that the Cinema Summit is wrapped, all cinema industry eyes are on CinemaCon 2015, coming fast on the heels of NAB, with the expectation that Dolby will use its footprint in the market, its new alliance with Christie, and its formidable PR machine to shake things up in the movie exhibition world. The road to that rollout, that culminated in the April 1st debut at the TCL Chinese Theatre, was a long and circuitous one. It started with IMAX making an early investment in the company Laser Light Engines. It then acquired the Laser/3D IP from Kodak. But as of last year’s Cinema Summit, David Keighley, Executive VP of IMAX, on Michael Karagosian’s panel “The Future of Cinema”, offered no hints about the final format of the coming IMAX Laser projectors. Then, in a somewhat surprising twist in summer 2014, on the eve of InfoComm, Barco announced that laser veteran Bill Beck had joined Barco’s projection development and marketing efforts. Fast forward to late 2014, and this month’s IMAX debut of Laser in L.A., and IMAX has solidified its relationship with Barco. The new IMAX unit used at the TCL Chinese Theatre marries an IMAX system with a Barco laser engine. It would not be the Cinema Summit if we did not get a good look at some great images up on a big screen. This year, Barco had the only Laser projector being demo’d for the conference. And they did not disappoint. Barco’s Goran Stojmenovik demo’d the company’s new Laser projector by showing clips from Dawn of the Planet of the Apes. Barco places all the RGB lasers inside the projector, in a single projector 3D design that delivers 56K lumens to the screen. But it would be a mistake for any reader to assume that the biggest players– in terms of influence and trend-setting– in the cinema projection industry (Barco, Christie, and IMAX), are now paired off into two camps, the Dolby/Christie camp and the Barco/IMAX camp. We should wait until after CinemaCon and let Christie unveil more about their plans going forward. But it’s safe to say that of all the big players, Christie does not have all its chips in one market. Christie is well positioned to market large venue Laser projectors in applications not cinema-related: event staging (big concerts, corporate meetings, etc), theme parks, simulation, and more. Dolby will be interesting to watch. Dolby has said that delivering HDR (High Dynamic Range) to the home will be easier than doing 4K, and this week they are saying more important as well. This week, Dolby will be demo’ing HDR offerings at NAB with their Dolby Vision. Dolby has already announced plans for Amazon, as well as Netflix and others to provide “Dolby Vision” content “when Dolby Vision-supported TVs are available.” Does any of this sound familiar? An elaborate commercial movie theater/home theater master plan. I’m sure the former TI folks at Dolby, as the well as the former TI folks at other companies will be keenly watching whether Dolby can do the very difficult: establish branding in the movie theater, and then leverage that branding to get consumers to double down on that in their living rooms. It’s nice if you can do it, but it’s trying to get the tail to wag the dog, in today’s world where consumer technology is at the top of the branding/marketing pyramid not the bottom. And there are other players. Sony still has some cinema (albeit not growing) market share, and in only takes one product launch for them to get back in the game, now that the game is changing to Laser. NEC has been more content to go after the smaller screens in cinemas. In fact last year, NEC launched a Laser projector that is very different that Barco’s and Christie’s bigger guns– an attempt by NEC to come in under the FDA’s regulatory radar, with a product that because it’s less than 6K lumens, the FDA does not regulate its use in theaters. Just as it would be mistake to be obsessed with Christie/Dolby/Barco/IMAX politics and strategies, it would also be a mistake to think that Laser projection is the only thing on Hollywood’s, and NATO’s, mind. It’s not, and this Cinema Summit featured a variety of discussions and panels that brought some of the country’s best technical and marketing minds together, on topics ranging for HDR, to virtual reality image capture and projection, to creative frame rates, to multi- and mega-channel sound for movies. Stay tuned for more from NAB, and the many tail ends of the Cinema Summit.